Medical science and technology advances constantly. There is a whole industry of design and engineering specialists contributing to this fundamental pillar of modern society. WDS Component Parts Ltd. is a key contributor of standard parts and accessories to the medical equipment industry. As the National Health Service (NHS) celebrates its milestone 70th birthday, its staff is working hard to serve today’s patients. Equally importantly, managers are looking forward and preparing for the future by developing plans that will drive continuing advances across all aspects of medical services and healthcare. Huge strides are being made in areas such as the treatment of cancer, cyst fibrosis, heart disease and dementia. People are living longer and there is a growing emphasis on encouraging healthy lifestyles. To support these scientific and social advances, medical technology has to move forward at an equal pace, with existing types of healthcare equipment and patient aids being improved and new ones being developed. Julie Smith, a medical industry specialist with WDS, explains why making and maintaining medical equipment is a specialist branch of the engineering world. “We supply components to most of the major UK medical equipment manufacturers, and many of their requirements are the same as for other engineering companies,” she says, “after all we are all working to the same laws of physics. “However, with medical work hygiene is never far from mind, so WDS supplies a lot of stainless steel parts. Similarly, the medical companies also like to use high performance thermo plastic parts that are good for hygienic applications, warm to touch and less clinical looking than metal counterparts. In both cases such parts are designed for cleanliness, with, for instance, rounded corners that are easy to washdown so that dirt and bacteria are less likely to accumulate. WDS parts are likely to be found in a wide range of medical and patient care equipment. This includes mobility aids such as wheelchairs and walking frames (with and without wheels), hospital ward equipment such as specialist beds and patient hoists. It also supplies to companies that make stands, frames and supports for equipment such as monitors and fluid drips. 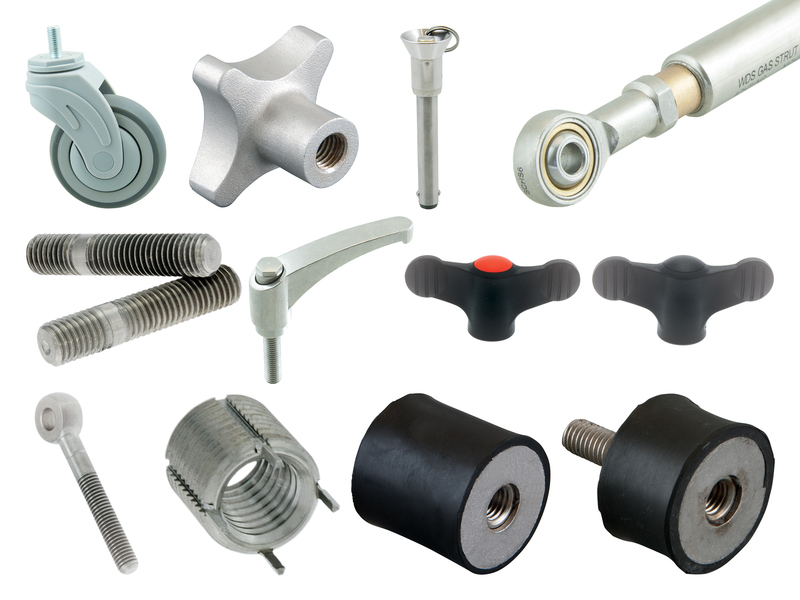 These components are selected from across WDS’s wide range of parts and include: wheels, casters, and levelling feet; locating pins and detent pins; handles, levers, knobs and handwheels; hinges, locks and latches, all manner of nuts, bolts and screws; lifting eyes; gas struts, anti-vibration mounts, clamps and even hydraulic boosters. Many of these parts will be used by medical staff or the patients themselves to set up and adjust the equipment, so must create a sense of reliability and fitness for purpose. “Quality is a big issue for our medical customers,” says Julie. “For them it is not just a matter of being strong enough for the job in hand, there is a recognition that parts will only have limited opportunity for servicing, so need to be largely maintenance-free. They have also got to meet cleanliness criteria and – very importantly – offer low noise operation so that patient calmness and confidence is not undermined. A big part of WDS’s work in the medical equipment field relates to repair and maintenance. Patient safety has to be paramount, so most medical equipment is designed to be robust and as near indestructible as possible. Healthcare providers are mindful of the fact that equipment may have a long working life and needs to remain safe and reliable at all times. Hospitals can adopt a scheduled maintenance approach, although they do like servicing to be quick and simple, something the makers have to consider at the design stage. However, managing the servicing of mobility equipment and other items likely to be used in private homes or in care homes will, on a practical level, be very difficult. Thus, it is imperative to develop designs that are largely maintenance-free, and quick and simple to service. Some equipment may need to be based on a failsafe design or to have an alarm built in.